A strong expert in blockchain and STO consultancy - DLT Capital - is making its way in STO space to become an ultimate go-to solution for everyone who’s willing to conduct a security token offering. 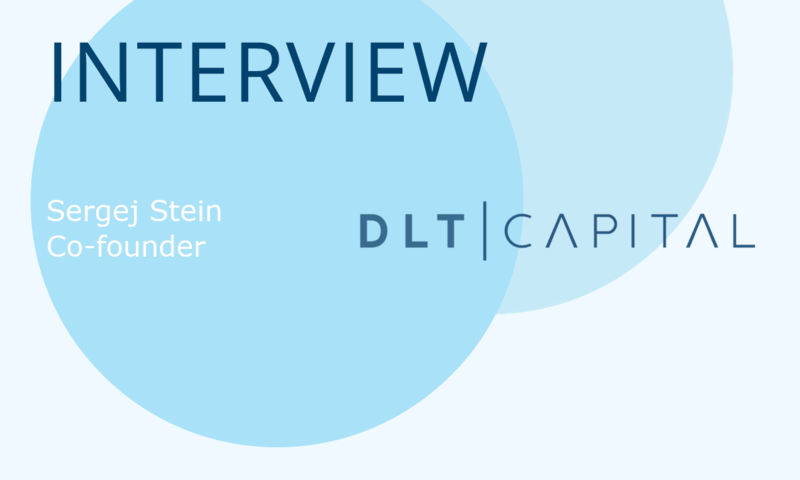 We talked with DLT Capital Co-Founder Sergej Stein about their story of success, challenges and goals. Tell us about DLT Capital. What is your main area of expertise? DLT Capital (formerly CF-Advisors) was founded in 2015 and has been involved with several blockchain projects that have raised over $200M and been involved in buy and sell side M&A deals with over $1B in transaction volume. Our main area of expertise is to help companies to tokenize their underlying assets. This includes connecting them with the right lawyers to get the approvals in their jurisdiction, find the right token issuing platforms, the best exchanges, and to polish up their financials and pitch-deck. Then, we can help them meet the right investors. We are basically the one stop shop for conducting their STO and fundraise both with our in-house team and from our wider professional partner network. Can you tell us about how DLT Capital team came to be interested in the Digital Securities space? Having a strong corporate finance and investment banking background, we recognized how the digitization of securities and the disruption of finance, in general, would be a very exciting field. We see security tokens as the next logical step in the evolution of blockchain crowdfunding. In 2017 everyone saw the whole ICO craze and utility token drama and recognized that projects came up with insane token ideas, to avoid regulation and find a quick profit on the back of uneducated retail investors. We want to help responsible companies work with regulators. We think that programmable and self-executing contracts on blockchains such as Ethereum or Stellar, bring an additional layer of trust and cost-efficiency to the traditional fundraising space. Most likely in the future, tokenized securities won’t be an option, but rather a must and the new standard due to all the benefits that will unfold throughout the journey. Regulators are already realizing this, for example, the German Finance Minister recently announced that digital securities on Blockchain/DLT are one of their top priorities and they want to become a pioneer in this space. We hear a lot of business cases about DLT pilot projects launched by Enterprises like IBM, Microsoft, Oracle, SAP, Tencent. As a blockchain consultancy, who do you think will benefit more from the technology: SMEs or Enterprises? The common opinion is that enterprises actually profit a lot from centralization, as they control the data and monetize it for themselves. There is a lot of IP to protect, and at this point, in my view, this is why most enterprises would not operate on a public blockchain. In the long run, we think that all businesses will profit from Blockchain technology. One sector that will benefit the most is SMEs who require a lot of third-party verification (e.g. supply chains). The review of certain company information prior to the investment is a hard exercise, especially in this nascent field. Different investors have different due diligence requirements. Could you describe your approach? We usually start with a basic Client Survey (e.g. two pager) and research on the company register. This gives us a quick overview of the needs and status of the business. Once we are satisfied that the company is legitimate, we dive deep into the strategy, business model and financials of the project, to assess possible success drivers, KPIs, identify existing pain points and bottlenecks. This helps us have a holistic picture. When it comes to recommending investors, we want to make sure that the business is as ready as possible for the fundraising stage. At the same time, we want to suggest investors who have a thesis and focus that would be complementary. We work hard to keep a personal relationship with our investor network, so we know what they are currently interested in. This email adress doesn't seem valid. How do you evaluate the level of awareness and understanding among investors about the new technology and investment instruments? This is a brilliant question and in fact a very difficult task. Currently, there are some concerns with professional investors in the STO space. Some professional investors are avoiding the STO space. For others, their fund structure simply does not allow them to invest in this new asset class even when there are very good projects. We know that certain VCs and Private Equity investors could benefit from this more liquid asset class, so we are always working on education. One of the problems is that many current STOs basically represent debenture bonds with participation rights and fixed interest. So it is a debt instrument more than a classical equity share. However, the key difference is that a tokenized security is more liquid and can be traded on a regulated market. We believe that education is key and that in the near future, we will see more and more investors use STOs to complement classical equity rounds. Blockchain moves into the top spot for hottest job skills. How big is that problem for startups you are working with? There is a huge demand for talented programmers and software engineers in that space. Many startups that we have worked with have benefited from working with our trusted partners for developing their blockchain project. If needed, we help our companies to outstaff skilled developers and to find ways to bring in talent while keeping costs low. In general, we think that the Blockchain space needs to become more mature and needs more salespeople and managers with vision. A lot of projects lack adoption because they only hired developers, but no one that actually promotes their product and helps them to scale. We also know that the role of CFOs will become more important and valued because there are a lot of projects with poor budgeting and mismanagement of their own finances. DLT Capital is listed as an official Sponsor of the Gibraltar Blockchain Exchange (GBX). Recently you have announced the partnership with CoinSchedule. What we will hear next from DLT Capital in the near future? We aim to be one of the earliest adopters of various projects building protocols for Security Tokens, such as STACS Protocol by GSX or Market Access Protocol of Swarm Fund. In addition, we are working with a trusted third-party broker-dealer to be able to work even more closely with regulated exchanges and to pool investments from our network and make investments in STOs or equity easy and affordable. Our goal is to have a technical solution for leveraging investments into tokenized assets.